The King Oyster or Pleurotus Eryngii mushroom has antioxidants that help to keep disease away. The antioxidant in this mushroom comes in the form of an amino acid known as ergothioneine. When a person consumes the mushroom, the ergothioneine finds its way to the vulnerable areas of the body and sets off cleansing them. These sensitive areas include the eyes, the kidney and the liver. Antioxidants are elements that reverse oxidation. Oxidation is the process that causes rotting or disintegration of substances. For instance, the process of oxidation will cause a piece of meat to rot while the same process will cause body cells to disintegrate. Body cells do not necessarily rot after oxidation, but they create free radicals which essentially are damaged cells. Just like a damaged patch of a fruit causes more of the fruit to rot, so do damaged body cells. That is how cancerous cells spread. An antioxidant is very precious because it gets rid of these dangerous free radicals and the healthy cells are left in a healthy environment. This mushroom also carries statins, which are disease fighting compounds. The particular compound found in the mushroom,Pleurotus Eryngii, is called Lovastatin. It is a compound that helps to clear cholesterol from your circulatory system. Once the blood is free of cholesterol, blood circulation is enhanced and the body feels healthier. A research done on mice in 2009 indicated that Pleurotus Eryngii has the effect of controlling insulin in the body too. These findings were also confirmed by research done by Richard Sullivan: University of Strathclude; Medicinal Mushrooms –Their Therapeutic Properties, Richard Sullivan, May 2002. Cholesterol accumulates in the body usually due to poor feeding habits mostly through regular consumption of refined foods. Another way is through consumption of fibrous foods that have been cooked over high heat for long spells until the nutritional value is diminished. This mushroom is also an excellent energy booster and many sportsmen are pondering how they can get a regular supply so that they can incorporate it in their diet. Pleurotus Eryngii is also credited with improving blood levels. This is important in an era when the number of people suffering from anaemia is on the increase. The nutrients in this mushroom that help to raise the haemoglobin are considered invaluable in the medical field. 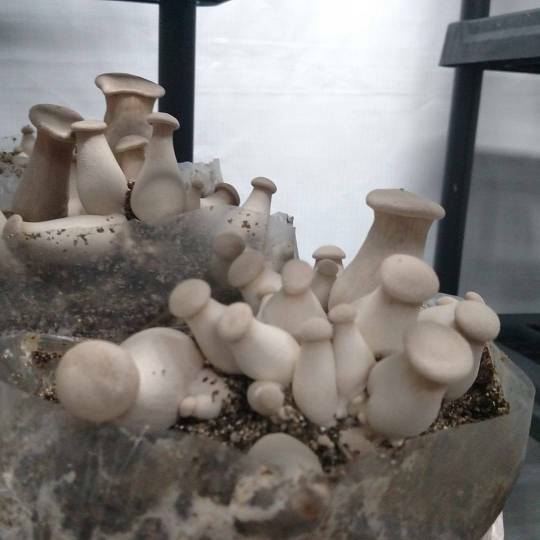 It is also reported that the Pleurotus Eryngii mushroom has antibacterial properties. There are very many diseases that are caused by bacteria including cholera and tetanus. So a plant that can fight bacteria is definitely a life saver. It becomes all the more significant because a natural remedy like a mushroom rarely has adverse side effects.